Hi! I've missed you. I've missed blogging. I've missed cooking. It's been a bit of a miserable summer of bar studying, but it's finally, finally OVER. Summer is always one of my favorite seasons for cooking because of the fresh fruits and vegetables everywhere, so it was hard not to have much time for cooking this summer. I ate a lot of cereal and take-out. Not great. Although our squash plants didn't end up having much of a harvest, we've had a ton of cherry tomatoes and cucumbers. I did manage to make refrigerator pickles and some simple pasta dishes with tomatoes. 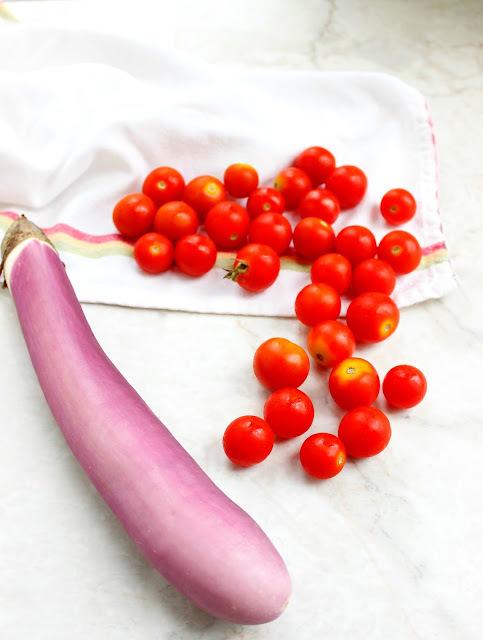 Now that I'm easing my way back into the kitchen, I knew I had to make something with cherry tomatoes, and once my mom gave me this beautiful Japanese eggplant from her garden, I knew just the thing: simple eggplant and tomato stew. 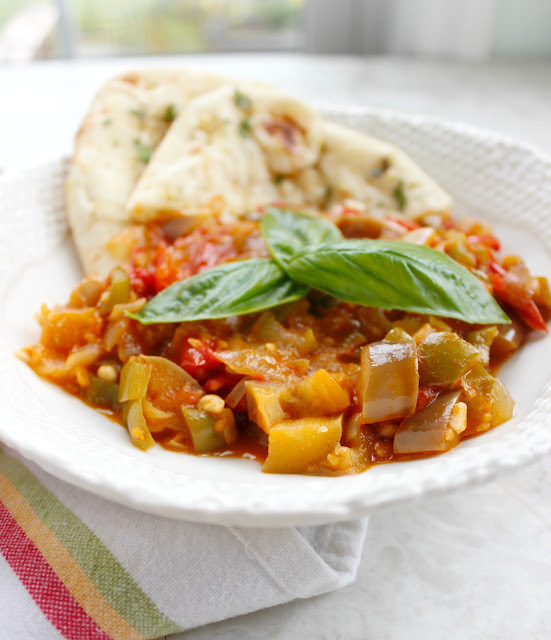 This recipe is inspired from one of my very favorite dishes at Med Deli in Chapel Hill--their eggplant, squash and tomato stew. 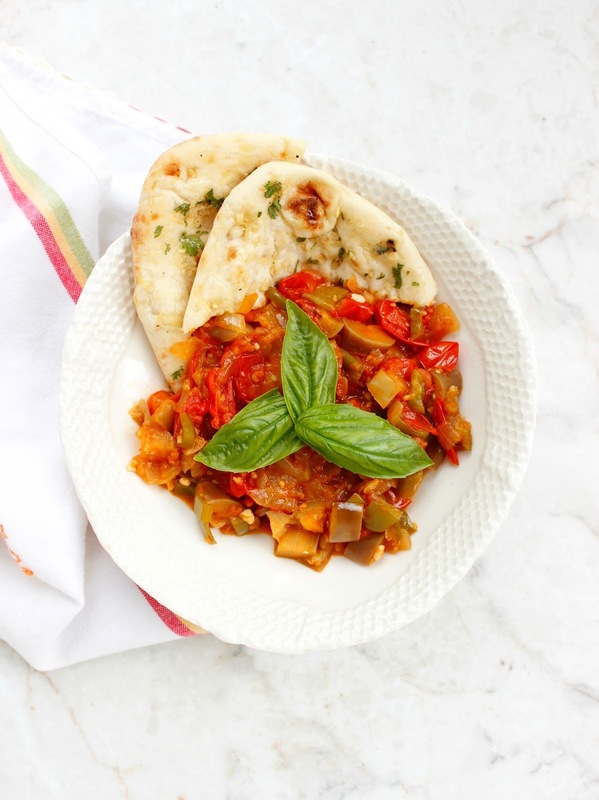 It's essentially eggplant, tomato, and onion that are cooked for a long time until everything is disintegrated and delicious. I'm not sure if everyone is a fan of vegetables cooked until they're totally falling apart, but I can assure that in this instance, it's wonderful. The recipe here is very loose here--feel free to add more or less of what I have, or add in other vegetables as well. There's no way to mess it up. To take it in the mediterranean direction, add cumin and paprika and maybe sprinkle it with feta cheese at the end. To take it in the Italian direction, add parmesan cheese and fresh basil at the end. Either way, serve it with some bread for dipping. It makes the whole experience. What this means for the blog, I'm not sure. BUT, Adam and I also just returned from a wonderful trip to Colorado, and I have lots to share about what we did and where we ate. Thank you, as always, for reading along. Add butter and olive oil to a large saucepan over medium heat. Once butter is melted, add the onions. Cook for a minute or so and then reduce heat to medium low. Continue to caramelize the onions, stirring every few minutes, as you prepare the other ingredients. Once the onions have caramelized to your liking (I cooked mine for 15 minutes or so, you can do longer if you have more patience), add the cherry tomatoes. Raise heat to medium and cook tomatoes and onions for an additional 5 minutes, or until the tomatoes have softened and started to burst. Add the chopped green pepper, eggplant, and garlic. Stir to combine, then cover. Continue cooking the vegetable mixture for about 20 minutes. Every few minutes, remove the lid and stir. 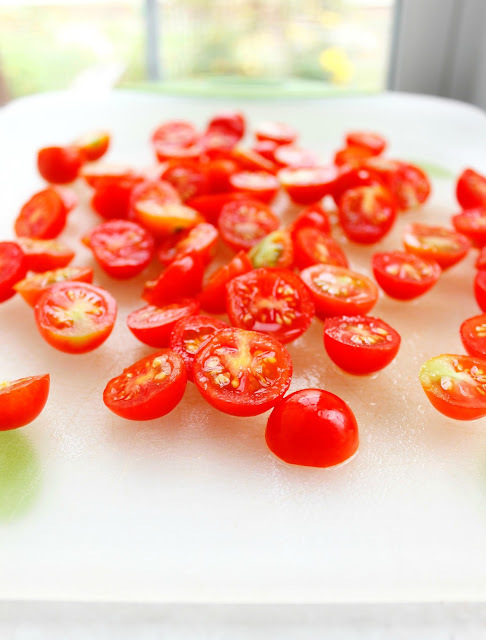 The tomatoes should have produced lots of liquid, but as the liquid starts to evaporate, add water. 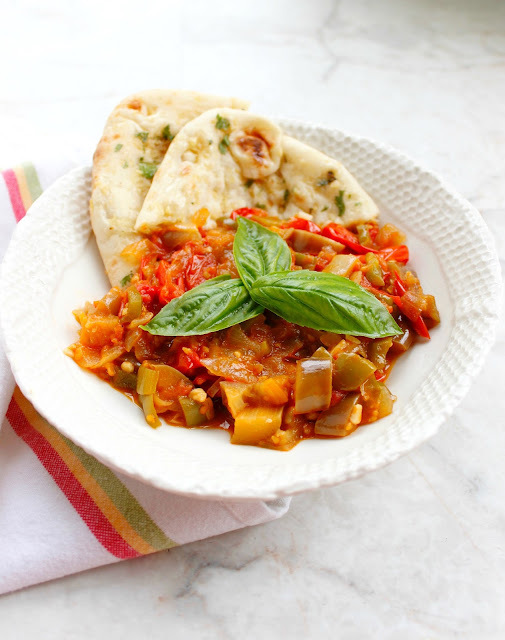 I consider the dish complete when the eggplant pieces have started to disintegrate and the whole mixture resembles something you want to scoop up with pita bread. Be sure to season liberally with salt and pepper. Serve with pita bread or naan and chopped basil and grated parmesan cheese, if desired.